Hi, ich bin Max Peters, 26 Jahre alt und starte ins 3. Mastersemester. Solltet Ihr Fragen rund um den Master „Biomedical Engineering“ haben, die Euch die offizielle Website noch nicht beantworten konnte, stehe ich Euch gerne zur Verfügung. 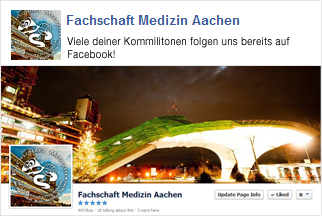 Da wir, im Vergleich zu anderen, nur ein sehr kleiner Studiengang sind, haben wir keine eigene Fachschaft, sondern sind Teil der FS Medizin hier in Aachen. Meine Aufgabe als Referent ist Probleme, gemeinsam mit der Fachschaft, die diesen Studiengang betreffen anzusprechen und nach Lösungen zu suchen. Hi, my Name is Max Peters, I’m 26 years old and I’m starting with my 3rdsemester of the master’s program. If you have questions concerning the “Biomedical Engineering” master’s program that the official website couldn’t answer you, feel free to contact me. Because we are only very few people in the master’s program we don’t have our own student council but are part of the student council of the medical faculty. My task as the student representative is to work together with the student council on problems affecting this master’s program.